Nouveau Paris is a four year old fragrance line which already offers over a dozen scents, divided into the Les Fleurs collection for women and Dumann for men. Wearers are encouraged to layer most of the perfumes "to adjust their scent according to their changing moods and lifestyle." I am not big on layering, being a) too lazy and b) in a possession of too many bottles anyway enough fragrances to be able to capture my moodswings. That is not to say that once in a while it does not happen that no single perfume quite hits the spot; I am very fond of the Messe de Minuit + Yatagan combo upon which I stumbled on a day when nothing in my scent wardrobe fitted the melancholy bloodthirstiness of the moment. To make the long story short, among their fourteen scents, I was most interested to try Nouveau's Blue Diamond, the fragrance advised to be worn on its own. It also includes a plum note, and I adore plum in perfume. If you like it too, then you would be pleased to smell quite a lot of it in Blue Diamond. The honeyed juiciness of ripe plums stays present on my skin from start to finish, its sweetness complimented by a nectarous rose and balanced by a fresher, drier floral accord that might include jasmine. I like the uncomplicated smoothness of the scent; the sweetness of the fruit is not excessive, the floral accord is not overwhelming... "Mellifluous" is the word that comes to mind when I think of Blue Diamond. 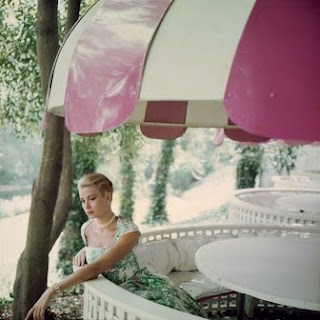 A good scent match for a mood "to be Grace Kelly", charming, feminine and poised. Which, you might be surprised to hear, visits me almost as often as the murderous mood of MdeM+Yatagan. Do you like to layer fragrances? Any favorite combinations? Do share! Blue Diamond is available at newparisinc.com, $55.00-$85.00. I love a good plum scent too, especially if it's not all sugared up with too much other stuff and you can really smell the essence of the fruit. En Avion and Tabac Blond! Leather and flowers- LOVE that combo. What a striking combo! Very chic. I don't usually bother layering, either, but lately I've been playing wit a Tubey Crim/Ambre Sultan combo. Still working on the proportions, but I think I'm onto something -- I think it's the same impulse that leads Flora to combine florals with Lonestar Memories. Wow, what a combo! Powerful but, undoubtedly, gorgeous. I've never heard of Nouveau Paris but it sounds like more smart marketing, in the same vein as JM, enabling you to buy scents meant for layering; hence, buy many bottles! This Blue Diamond sounds deeeeeeeelicious! Plum is so hot right now.....cue Natori edp. Marina, it is sooooooooooooooo vilikalebna (a word my Russian Granma was fond of integrating into her elegant Spanish) to get a 'chic' from you! I wonder what's SL's take on layering and mixing. Sadly, I don't "know" Russian, but she gave me such gifts, uniquely Russian: the incredible sense of poetry, the sharp understanding of prose, the depth of feeling for landscape and its seasons, and her romantic perception of everything. Well, still, she was a Jew, but although she learnt to read and write the best Spanish possible, and "had" Yidish and French, she read Russian all along, and (being of her generation)used to recite Pushkin, Lermontov, Tsvetaeva...while preparing black grape "varenye". I think SL does the layering in his mind, then produces a fragrance. Isn't Gris Clair the obvious result of layering? Surely, being such a genious, he would admit, secretely, to any experimentation. Secretly, probably, he would :-) I agree, GC and Encense et Lavande too. The man I admire most in this world is an English scholar who converted from Church of England to Russian Orthodox...I went with him to the Orthodox Church in Copenhagen...How could I ever think I could understand Dostoyevski without having seen the moment when the faithful kiss those striking icons. Bakhtin? Brodsky? Tolstoi without the splendour of the priest coming out from the hidden altar? Russia is capable of such emotional power. And elegance. A treasurable source. Do you have one too, a Russian grandma? :-) Your layering combo sounds wonderful. Plum! As always, a clarion call for me in scents. Blue Diamond really does sound fab. I don't layer nearly as much as I used to - too lazy these days. But my fave layering combos involve rose or violet scents w/ incense or woods. Recently I also started layering SL FdO w/ L'Artisan's Ambre. Oh, and yesterday we had our first day of cool weather, so I layered Tea for Two w/ Mechant Loup. Today I'm wearing Santal Noble and later I think I'll add on some Agraria Bitter Orange or MPG's Secret Melange - again to reflect this early fall feel in the air. My strangest layering combo is YSL Y parfum w/ Yosh's Trompeur. Oh, and I enjoy a touch of Chergui w/ Temperare 3. Plum with nectarous rose sounds great! LOL at melancholy bloodthirstiness- I know exactly what you mean!! Any other recs for salty incense scents? I forgot what a genius layerer you are! You make me want to start experimenting. I've been experimenting a bit lately, although I don't really know what I'm doing;-) However, I have had some success in pairing Tam Dao with EL Jasmine Moss and AG Chevrefeuille. The Tam Dao seems to soften the edges on these two - which suits my mood as the weather's been cooler lately and I don't seem to need quite as much crispness. I imagine the soft sandalwood of TD works wonderfully well with florals. "Melancholy bloodthirstiness." Perfect. Must remember. I tried this line and unfortunately none of the ones i tried seem to last very long. I purchased Feral Forest and Moonlight Dusk and tried some samples of the others. Unfortunately i will have to give this line the thumbs down, but must say their packaging is pretty. Maybe its my nose. Layering has been the way I've gotten through this doldrums stage, where nothing really works--I amplify weird aspects, and everything smells like mildew after half an hour. I love body creams (I live in a dry climate), so I find that mixing a body cream with a different fragrance can work wonders. My latest has been Chanel's Crystall Vert sprayed on Fresh's nectarine lotion. I'm sure I'll be struck my lightning, but it keeps the musk from mildewing. The fugitive Ananas Fizz stays in place over JM Mandarin/Basil cream. And I will (gasp!) spritz Divine Balkis on L'Eau D'Hiver cream. Sacrilege! Wonderful!